I’ve been in the fitness business for over 20 years (yes, I’m dating myself here! 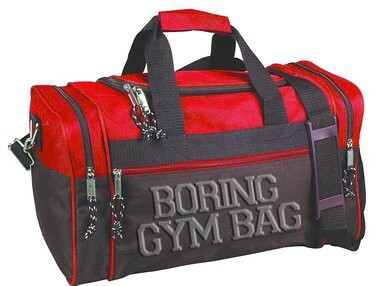 ), and I have to say, I have not seen a lot of “pretty” gym bags in those 20 years. This is a different generation. Today’s generation of gym rat looks a lot different than yesteryear. Fitness is not just for guys and girls who are into sports. Girls lift weights and train like athletes, but still enjoy wearing designer jeans and high heels. 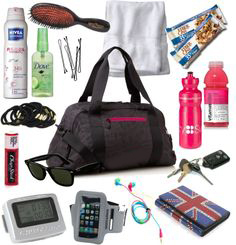 Fitness is a lifestyle and our gym bag is as important as our purse. 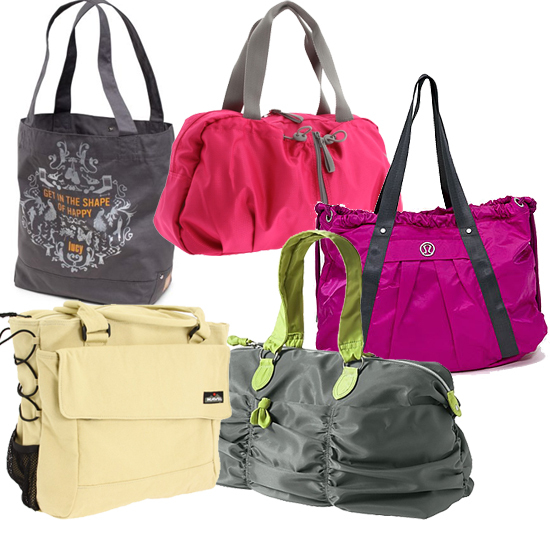 Shopping for a gym bag can be exhausting (unless you have a chick like me that shares their great finds with you. Wink wink!) If you are looking in a local sporting goods store, chances are, you are just going to find a good sports bag – and not have a lot of variety of style to choose from. If you go to a designer store, you might find a pretty bag, but it may not have all the functionality you need. While everyone’s needs and tastes are different, I think a few things are probably pretty important to most women – however, I don’t think every shopper really thinks about what they want before they start looking. Instead, they just do an impulse buy, buying either what looks pretty on the outside, or what is a good deal. Here are the 3 main features I look for when shopping for a new gym bag. 1. Pretty. Yes, pretty is important to me. I think I use a gym bag more than any purse I own, so I want to enjoy it. Who’s with me? 2. Functional. It HAS to be easy to use. If I have to fight with the straps, zippers, space, shape, etc, I won’t wear it. No “good deal” is worth even a little money if I waste it and don’t use it. I am looking for the PERFECT bag, not just any bag. 3. Practical. I look for a LOT of pockets – and the MORE the MERRIER! I need a place to put my water bottle, fresh clothes, dirty clothes/stinky shoes, phone, “purse stuff” (like lip gloss, wallet, keys), and a place to put my gym accessories (like headphones, ipod, straps, etc). 4. Durable. There are a few things that give out quickly with gym bags. Zippers break, the nylon frays, and the straps break. I don’t know how many gym bags my husband and I have gone through over the years (back when we got our gym bags at discount department stores and we never paid more than $39.99 for a bag). I have to admit, you get what you pay for. I am afraid to think of the money I’ve spent wasted on stuff (because it was a good deal) – but I never used, or it didn’t last. A gym bag really is an investment to people who really live the fitness lifestyle and rely on them. Durability is a must, and it’s OK to spend a little more on it if it lasts and you love it. I was so stoked to have the opportunity to do a product review on the Fivesse Home-Gym-Home Bag. By the looks of it, it was going to meet all 3 of the criteria I look for – and BOY, did they meet all my expectations and more!! 1. It is stylish and pretty. Seriously, how many gym bags can you throw on your shoulder like a purse and wear with heels? 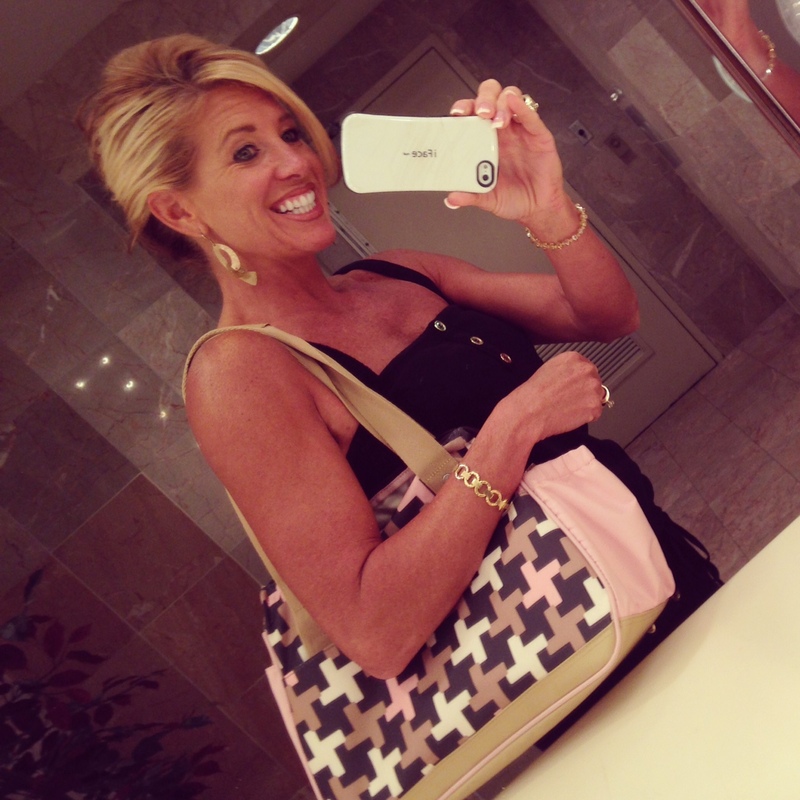 I used this bag as my purse the entire time I was in Atlantic City with my mom for Ms. Senior America. 2. It has 10 separate compartments - all labeled so you know exactly what each pocket is designed for! There is the main compartment for your clothes and large items, a vented pocket for shoes or dirty clothes, a medium size internal zipper pocket for make-up and accessories, a pouch for headphones and ipod, a zipper pocket for jewelry, a pocket for sunglasses, an outside pocket for your phone, another pocket with elastic trim to hole your water bottle, a small outside velcro pocket for your gym membership card and a big side pocket (which also neatly hides the yoga straps when you aren’t using them). There is also a hook to put your keys on, so you don’t have to dig around in the bottom of your bag looking for keys! What more could a girl ask for?! 3. It is the perfect size. The Home-Gym-Home is the perfect size for me. I don’t need to pack a hair dryer and my entire dressing room since I’m just going from the home to the gym and back (hence the name of the bag!). They MADE this bag for people just like me! In my bag, I have a fresh set of clothes, ipad, headphones, iphone, iphone armband, hair ties, jacket, water bottle, wallet, sunglasses, iphone charger, note pad & pen (I do some of my best thinking at the gym! ha! ), body spray, lotion and business cards – and still have TONS of room to spare! 4. It doubles as a great travel bag/purse! I didn’t plan this, but I ended up using this bag instead of my purse for my entire trip to New Jersey last month. I put my hotel key card where the gym membership card went and enjoyed all the pockets to use for my cameras, smart devices, umbrella and all the things I needed to travel with ease. This would be a GREAT bag to take on an airplane. Seriously, this bag couldn’t be more handy. 5. Is has great colors. The color combination of black, tan, cream and pink make this bag even more versatile. It looked great with all black, and it looked nice with tans and browns too. The pink softens it up so no one would ever know you are carrying a gym bag – and the pretty hounds tooth design sets it off beautifully, adding a perfect touch of class and design. 6. It comes with a cool little headphones organizer. The simple little disc (in the shape of their logo, pictured below) makes it easy to wrap your headphone chords up neatly so they don’t get tangled. I don’t know about you, but i used to spend a lot of time untangling my chords every time I did cardio. No More! What a nice little extra touch!! 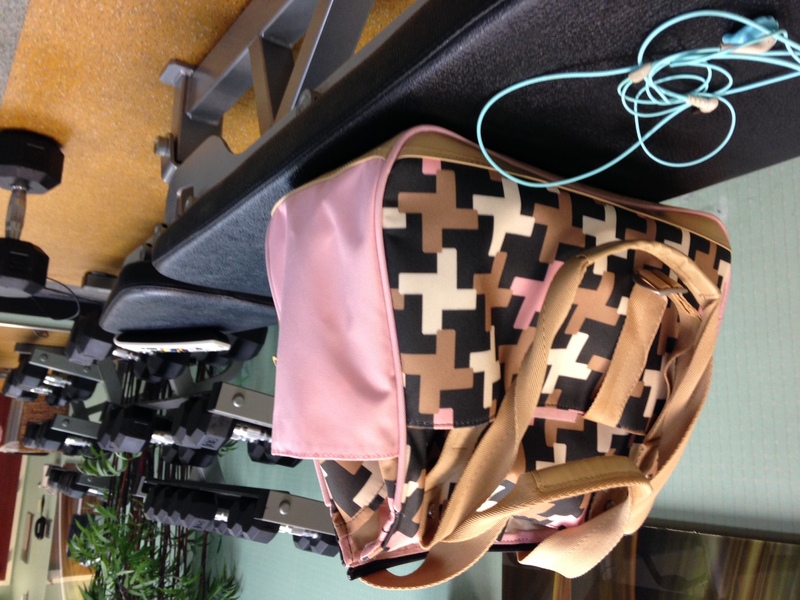 I love this bag so much, this bag is the FIRST to go on my Merry Pfitness Pfit Pfinds List. 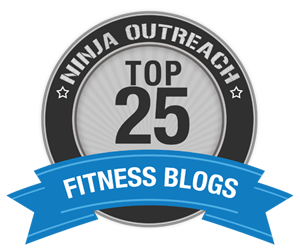 Look for this logo on any of my blogs for my personal recommendations of Christmas Gift Ideas for the fitness enthusiast. Follow my Merry Pfitness Board on Pinterest for more Pfit Pfinds as I begin shopping and exploring gift ideas! If you are interested in getting one of these beauties, I will be giving away a special 50% OFF COUPON to ONE lucky WINNER. Entering to win is easy as 1, 2, 3! 1. Subscribe (if you aren’t already subscribed). 2. Share this blog on your social channels. 3. Comment below and tell us why you’d like to be the next proud owner of a Fivesse bag! The winner will be selected randomly by a computer generated program so don’t worry, no “favorites” here. Stay tuned for the announcement of the winner (which I will post on the bottom of this blog when they are chosen).